I know I’ve been absent from this space for a couple of weeks. Life gets busy and a little overwhelming sometimes, you know? But I’ve got so much to be thankful for this year. The first thing that comes to mind is health. On Thanksgiving Day nine years ago, I had just found out that I had breast cancer. I had a 4-year-old, a 2-year-old, and an 8 week old baby. So, health is always at the top of my list of things to be thankful for. The Husbands job, smart, healthy kids, friends, family, a wonderful town to live in, three sweet pets, the list goes on and on. I am also thankful that my dad is here to celebrate with us. 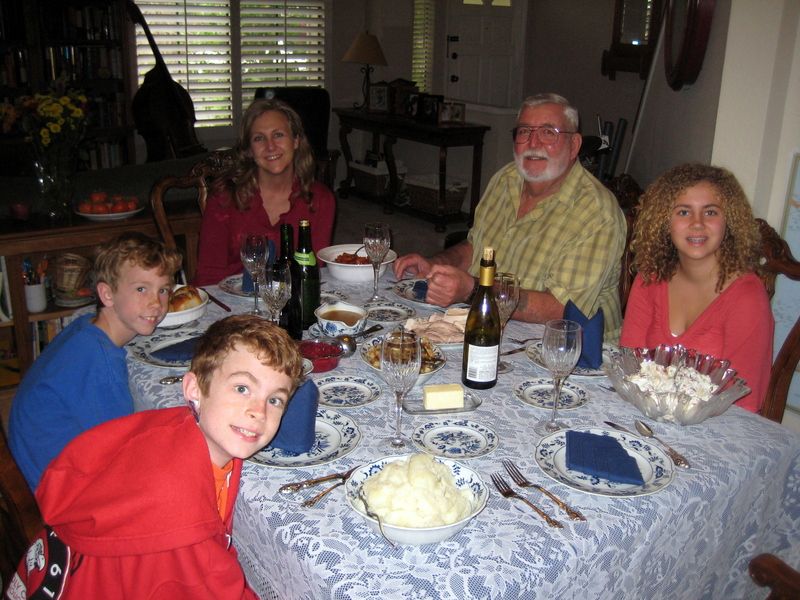 Especially because four years ago after he came for Thanksgiving, he had a heart attack driving back home. Drove himself right to an ER and lived to tell the tale. So glad that he is still able to make the trip to visit us. I hope you all had a wonderful Thanksgiving! The girl and I are going to brave the mall here on Black Friday. Not even for Christmas shopping, she just needs some long-sleeved shirts now that winter is finally arriving here in southern California. No crazy shopping times, just whenever we are up and dressed. I haven’t been out in the craziness for so many years, it will be like an adventure! A wonderful *belated* Thanksgiving to you too Kristin! 🙂 How blessed you are my friend…and a cancer survivor – God is Good!!! We’ve had the big C visit our house too. My husband was the recipient though, not myself. Puts everything in perspective doesn’t it? I’m glad you are all healthy and well and got to enjoy Thanksgiving together. Thanks for the comment you left on my post, Kristin! It’s always fun to “meet” a fellow Abundant Harvest Organics subscriber! Blessings to you and your family!